The all-purpose generic resume is being replaced by the targeted resume, a resume tailor-made for a specific employment goal in a job search. Targeting resumes isn’t just smart, it’s critical. A targeted resume convinces the reader your work will benefit a specific employer and that you should be among the candidates invited in for a closer look. Addresses a given opportunity, making it easy to see how your qualifications are a close match to a job’s requirements. Uses powerful words to persuade and a clean design to attract interest. You probably have an all-purpose resume lying around in a desk drawer somewhere. What you and legions of job seekers everywhere like about the all-purpose resume is that it casts a wide net to snag the attention of many employers — and it saves time. However, the one-size-fits-all resume is becoming obsolete and it’s going to get lost in more and more recruiting black holes. To save time when developing targeted resumes, you can build a core resume before the pressure hits, and then use it as a base or template to spin off targeted versions when you must move quickly. Jot down every factor in your background that you could use to customize a resume, from experience, competencies, and skills to education. This is your working model, a resume you will never submit to an employer but a rich well you will draw from time and time again. Use as many pages as you need. Research the requirements of a job. If you’re responding to a specific advertised job, jot down the requirements that the ad lists. Don’t confuse the job duties and the stated requirements. Deal first with the requirements and then see how you can show experience or education that matches the most important job duties. When you’re not responding to a specific advertised job but are posting your resume in an online database, attempt to attract interest in your candidacy by researching the most commonly requested qualifications for a given occupation or career field. You can do this by studying many job ads. After compiling the requirements you must satisfy in a tailor-made resume, scour your core resume to see whether you can add secondary items mentioned in the ad that further improve your chances and start writing. 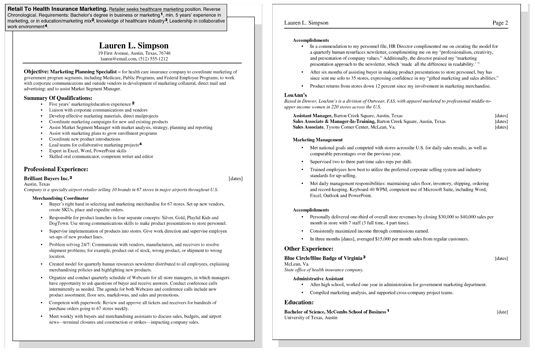 This sample resume includes information that targets a marketing position advertised by a health insurance company. The employer’s requirements (from the ad) are shown in a mission statement contained in the gray box atop the first page of the resume. To illustrate the concept of targeting, the bold numbers are cross-matched between the health insurance company’s requirements (in the gray box) and the job applicant’s qualifications (in the sample resume). For example, this applicant meets requirement 1 from the ad, as shown in the Education segment of the resume. These numbers are for illustrative purposes only. Click here to view this resume.